My Desk | Teacher, Becoming. Inspired by the video “people and their desks” and by EduSuz, here is a picture of my workspace. I can’t even call it a desk, because there are five pieces of furniture in the mix here. The black piece is an old vanity, which is theoretically my desk. My computer sits on our dining table because there is no room on my desk (it’s very small, and I am more of an “Einstein” when it comes to my desk. There is a filing cabinet upon which my printer/scanner sits, and behind the table is a bookshelf where I keep all my textbooks, notes, and supplies. The cabinet with photos on top holds most of the equipment that my business partner and I use to make natural beauty products – inside is beeswax, shea butter, and all sorts of fun goodies. This “desk” space is temporary – in July I will get to move into our second bedroom and pull my actual desk out of storage. I’m excited to have a little more space to spread out. Sunday I was having brunch with one of my friends, telling her that I felt like I was completely unorganized. She laughed and told me she thinks I seem like one of the most organized people she knows. I guess everyone has a different definition of organization! I don’t even have a desk right now. My stuff is spread out all over the house with my computer and some of my books by the coffee table, some books sitting on the kitchen countertop, and some in what we deem “the messy room”, where all the random things that we have get shoved into. So yes, you are actually quite organized in comparison to me! At least everything is all in the same place. They also mentioned in the video that a messy work space is a sign of creativity, so apparently I am very creative. My creativity is all over the house! 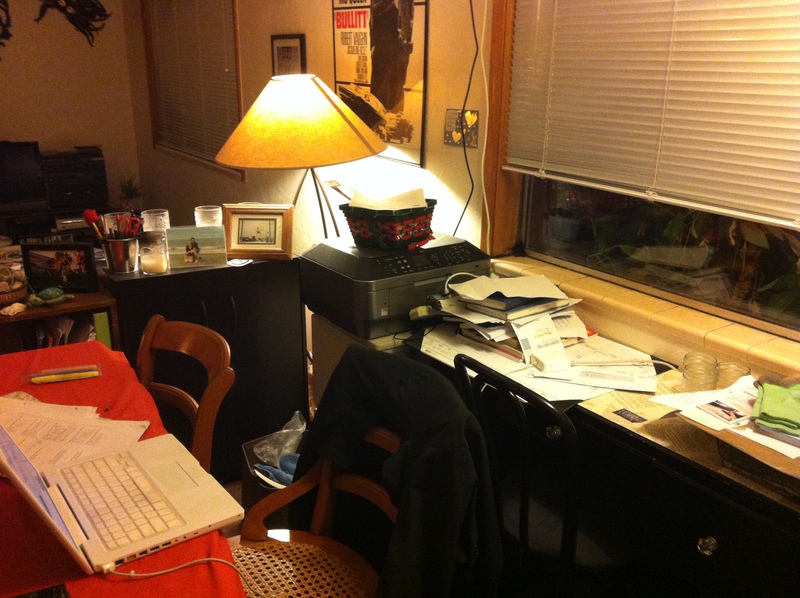 So the next time you feel overwhelmed by a messy desk, just think of how creative you are! It’s a good thing that teaching requires creativity. I have a desk, it is usually covered with a variety of projects. There is a computer there. Then there is the kitchen table, covered too, school work there. Lastly, half my school work is spread out on the couch along with the laptop! I too am organized all over the house. When I was working, my desk drove people nuts. They would always ask, “how do you find anything?” My answer was always the same, what do you want? I could put my finger right on it. What looks like chaos to some was organized to me. Organized Chaos. That is how I would describe my life. I guess this is just another example of how we shouldn’t be quick to judge others for how things look on the outside.